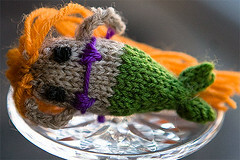 Having already knit the Tiny Rabbit and the Tiny Mermaid–wait, sorry. I don't think I posted the mermaid here, did I? Here she is. 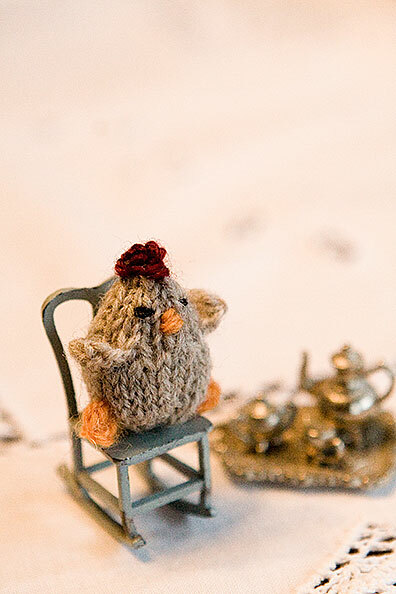 Having already knit the Tiny Rabbit and the Tiny Mermaid from Anna Hrachovec's Teeny-Tiny Mochimochi, the next choice of project was patently obvious: the Tiny Chicken. Now, as you will have doubtless realized, I have the complete trio from the immortal anecdote about the rabbit, the mermaid and the chicken who walk into Claridge's Hotel. But my parents are due to arrive any moment, and I must dash, so I'd love it if one of you could tell the rest in the comments. Thanks awfully! That book has been on my Christmas list since summer! Ah yes, that old chestnut...what a delight to remember. While I don't think I can do the remainder of the story justice, whoever does, please remember to include the part about the propensity of the mermaid to get the hottest possible tea during the high-tea service, so she can proceed to melt jam in it. It's my favorite part! I am absolutely crazy for that tiny chicken, way too cute! Wait...what? I missed something! :-D But then, I usually do. Cute chicken, though! No, no, no, Ruby. That's the story about the rabbit, the mermaid, and the chicken at the CRALIDGE Hotel. It was truly a tragedy, but it happened much later than the adventure at the Claridge. I really like what Tahmi had to say. That works just as well. They're beautiful. Just noticed the new Knitty scarf as well, love it! A tiny mermaid, a tiny rabbit and a tiny chicken walk into Claridges Hotel. A rabbit, a mermaid, and a chicken walk into... no wait, a rabbit hops, a mermaid wriggles, and a chicken struts into Claridge's Restaurant. The mermaid asks the waiter, "Do you serve rabbits here?" The waiter says, "Yes; they taste like chicken." They leave. Once upon a time, not so long ago, a tiny little rabbit with a wee pink nose and a cunning little knitted jacket decided he was going to go on a jaunt. His great uncle Edward, a hare of fine repute and impeccable manners, told him of his periodic jaunts to Claridge's to take afternoon tea. Nigel (that was the little rabbit's name) twitched his wee pink nose in excitement of having tea in such a fine establishment. He put on his best hat and hopped the crosstown bus for Claridge's. On the bus, Nigel found a seat next to a very pretty chicken. "Hello," he said, for he was a mannered little rabbit. "Do you mind if I sit here?" "You're very welcome to sit there," said the chicken. "Thank you very much. My name is Nigel," he said, taking off his hat. The chicken, who was knitting on something that looked like a cabled hat, nodded her head. "It's a pleasure to meet you Nigel. My name is Prudence." "I'm going to Claridge's to have afternoon tea," said Nigel. "Isn't that interesting," said Prudence. "So am I." "What is it you are knitting, if I may ask?" "It's a sweater for my sister. Poor thing. She was a battery hen and lost all her feathers. That's the price you pay for falling for a stranger's story." I want that chicken to carry around in my breast pocket. Don't know what's better, the post or the comments here...you are such an inspiration! lol. This is the reason this blog is on my daily afterwork knitblog reading! Y'all are hystercial! And word vericfication is clectr. Make of that what y'all will. Soon the bus arrived at the right stop and Nigel and Prudence stepped off. The wonders of London surrounded them, making Nigel gasp with amazement. What a memory this will make when he is old and has great-grandchildren! Prudence clucked at him and led him down the street where they arrived at Claridge's in all its opulence and grandeur. "We've arrived just in time for tea," said Prudence. "I hope they have lovely watercress sandwiches," said Nigel. "Those are my favorite." "I'm partial to seedcakes myself," said Prudence. Once inside the hotel they found the tearoom and an impeccably dressed maitre'd guided them to a table. A waiter with a pencil-thin moustache took their orders after they looked at the menu. "He looked very French," murmured Nigel. "Would they have French waiters here?" Prudence murmured back. Before Nigel could answer, he heard the sound of someone weeping quietly. He turned and saw at the next table a very pretty but sad little mermaid. The remnants of her and another person's meal were on the table. The little mermaid held a tiny lace trimmed handkerchief to her eyes and dabbed at her cheeks. "Excuse me," said Nigel kindly. "Are you all right?" "Oh it's terrible," said the little mermaid. "A sailor, brought me here to have tea but he grew very upset with me because I did not like the cakes. Now he's left me here and I don't have any money or any way to get home." Nigel thought the sailor was quite mean to have left the mermaid, who was very pretty, high and dry. How did he expect her to get back to the sea without any feet? It was quite the puzzle. He wished he had enough money to help pay for the mermaid's tea but he had just enough for himself. Prudence clucked and went to the mermaid. "Don't cry, dear," she said. "Perhaps he was just out having a cigar. You know how sailors like to smoke." The little mermaid only wept more. "He didn't smoke!" she wailed. "That's why I liked him so much! He didn't smell like the others!" Oh! 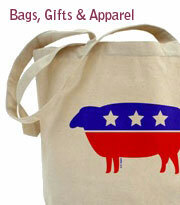 Your readers are just as nuts - sorry, inventive as you are! Can't wait for the dénouement of the story (stories?). Not had a chuckle like this in ages! Thanks. Awesome. The book is on my wish list though I don't think I've put that list where anyone can see it... hmmm. Larry just made me laugh so loud everyone wanted to hear what was so funny. Wow, that was the most fun I've ever hadreading comments on a Blog Post. Nigel was quite perplexed as to how to help out the little mermaid. While he was thinking the maitre'd came up to the tables. "Is there something the matter?" he asked kindly. As the little mermaid told him her problem, Nigel suddenly had an idea. The maitre'd was tut-tutting with sympathy when Nigel said, "Excuse me. May I use your telephone?" The maitre'd said, "Most certainly. Follow me," and led Nigel to the desk. Nigel took out of the pocket of his cunning little jacket a tiny phone book and looked up a number. Because the desk was so high, Nigel stood on a chair to use the phone. "Hello? Uncle Edward? This is your grand-nephew Nigel. I am well thank you. Yes, mother is well and so is father. Uncle Edward, I have a friend who is in need of some help. Would you be able to come to Claridge's? I would be ever so grateful. Wonderful! Thank you so much!" Nigel hung up the phone and thanked the maitre'd. "My uncle Edward is coming with his car." "Your uncle Edward?" said the maitre'd. The maitre'd straightened. "Gracious! You're his nephew?" "He is coming here to help." "He is? He is an excellent customer of ours. We will do our best for him and you." Nigel went back to his table and explained to Prudence and the little mermaid that his uncle would be coming to help. The little mermaid was very grateful. "I don't know what I would have done without your help," she said, shaking his paw. The waiters brought the little mermaid to Nigel and Prudence's table where she enjoyed a cup of tea with them as they finished their tea. As Nigel was wiping his mouth with his napkin, he heard a familiar voice and saw the maitre'd lead a well-dressed rabbit to them. "Uncle Edward!" cried Nigel, hopping down to hug him. "Nigel, my fine boy. You are looking well," said Uncle Edward. "Please introduce me to your friends." "This is Prudence," said Nigel, gesturing to the tiny chicken. Uncle Edward bowed gracefully. "And this is Lani," said Nigel, gesturing to the tiny mermaid. Uncle Edward did the same for the mermaid. "So what seems to be the trouble, Nigel?" "Lani needs our help to get home. She had come here with a sailor who left her here without paying the bill. She has no money and we don't have enough money to help her. She's very nice, Uncle Edward. Can you help her?" Uncle Edward rubbed his chin thoughtfully and glanced at the maitre'd. "Let me see what I can do," he said, and left with the maitre'd. "Oh I do hope he can help," said Prudence. "He seems to be a very nice man." "I don't know how I would get back to the sea," said Lani. "Even if I could get on a bus, I don't even have any money for the fare." "My uncle Edward is a kind man," said Nigel. "And he's smart, too." After a few minutes, Uncle Edward came back. "I spoke with the maitre'd," he said quietly, "to make sure that your story is true." He gave a pointed eye to the tiny mermaid. "One can never be too careful." Nigel's heart sank. Was Lani lying to try to get a free tea from Claridge's? He felt so embarrassed that he was duped. "However, in your case my fine young lady, your story is true. The maitre'd did see the sailor leave and saw that he did not stop to have a smoke." Nigel, Prudence, and Lani let out sighs of relief. "So what is going to happen?" asked Lani. "I feel so awful being left like this." "You won't have to work in the kitchen," said the maitre'd. "Mr Lagomorph took care of the check." Lani smiled happily and clapped her hands. "Oh thank you! Thank you!" "I will also be able to take you where you want to go," said Uncle Edward. "My car is here, so when you are finished, we will go home. Nigel, I can also take Miss Prudence home as well." And so it happened just as Uncle Edward said. He carried the tiny mermaid to his touring car and the four of them went to the shore where Lani could swim home. She promised she would tell her family of his generosity, for he had ships that sailed the sea and her family could protect them from storms. Prudence, quite excited to be riding in such a fancy car, left two eggs behind. She apologized as she left, but Uncle Edward laughed warmly and said not to worry. As they reached Nigel's home, Uncle Edward said, "You are a fine young bunny to be so kind to someone in need, but you have to be careful. Be wise in who you choose to help and be generous when you do." Nigel nodded solemnly. "Thank you for coming to help us, Uncle Edward." Nigel went to bed that night thinking about the day. He thought hard about what his uncle said. "People need people," he said to himself. "And a big heart can make a person smile." OoH FiberQat !! That was an excellent story if ever there was one to be told about the mermaid,chicken and little rabbit! 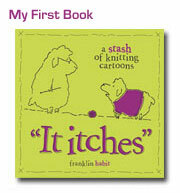 You and Franklin need to get together to make a childrens book, and I shall buy it for my two little grandchildren!!! "people need people"? Don't you mean mermaids need rabbits and chickens? Thank you! It was fun to set my mind free and channel Miss Potter. Thank you Franklin for sharing your teeny, tiny creatures and Thank you FiberQat for channeling Miss Potter. hello there and thank you for your information - I’ve certainly picked up something new from right here. I did however expertise a few technical points using this site, since I experienced to reload the site a lot of times previous to I could get it to load properly. I had been wondering if your web host is OK? Not that I'm complaining, but sluggish loading instances times will often affect your placement in google and could damage your high quality score if ads and marketing with Adwords. Well I’m adding this RSS to my e-mail and could look out for a lot more of your respective fascinating content. Ensure that you update this again very soon..
WOW! Your publishing has modified my viewpoint of Lion Product permanently (for the better, of course). What a nice position to examine when we get up to New You are able to.